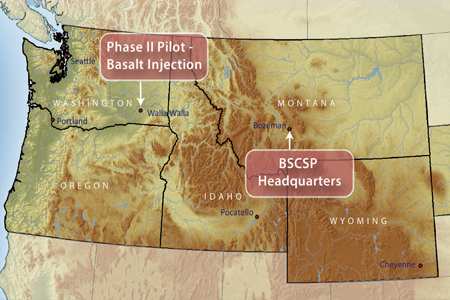 The Basalt pilot site is situated approximately 11 miles south of the town of Pasco in eastern Washington. The small-scale demonstration test is located on private property owned by Boise White Paper Inc. The study site is geologically part of the Grande Ronde basalt formation and is situated within the larger Columbia River Basalt Province. Similar to most basalt features, the Grande Ronde is composed of layered rocks that alternate between ancient hardened lava flows and more porous rock features. While the porous rocks are ideal for trapping injected CO2, the overlying bed of hardened lava effectively functions as a "caprock" and seals the injected CO2 from leaking to the surface. 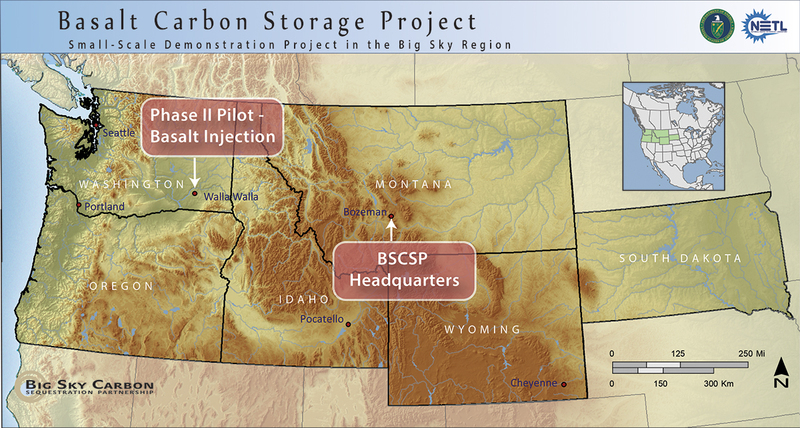 Initial characterization of the proposed injection site involved an in-depth assessment of the subsurface geologic properties. During this process, scientists collected and analyzed a large amount of data on the basalt formations, including geochemical composition, mineral content, seismic information, satellite imagery, core samples, and chemical trace elements. Analyses of these components allowed scientists to select the most optimal geologic zone for CO2 injection and determine the most appropriate long-term monitoring practices. 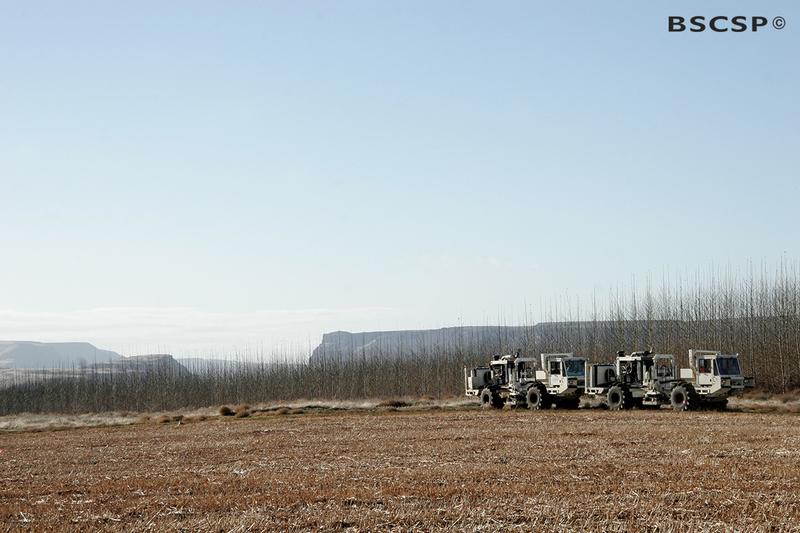 As with the Kevin Dome Carbon Storage project, assessing the underground geophysical setting of the Basalt research area involved a seismic survey. 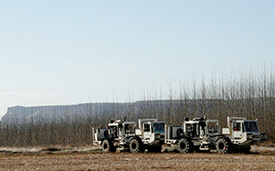 Two vibroseis, or “Thumper Trucks,” were used in this project to survey a four mile area near the proposed research site. Seismic surveys provide data to map the geologic environment, including the location, depth, and type of rock layers located below the surface. Read more about how seismic surveying works on our Kevin Dome project page, or by downloading the seismic surveying factsheet. To establish baseline measurements for the project, groundwater and soil gas samples were collected in the research area. The hydrologic tests were also an important part of the permitting and monitoring process. Geologic carbon storage activities must avoid impacting underground aquifers and other sources of drinking water. Understanding groundwater characteristics additionally involved examining the microbiological processes taking place underground. This is important because researchers can learn a great deal of information regarding the chemical exchanges and interactive properties occurring between microbial communities and environments where CO2 has been introduced. When CO2 interacts with water bodies, the acidity or pH levels of the water often change, and this may affect the environmental conditions that sustain microbial organisms. Correspondingly, microbial responses to heightened levels of CO2 may tell scientists valuable data regarding the role and micro-scale interactions taking place between microbes and the surrounding basalt environment. Understanding how and why certain microbes react to changes in CO2 can additionally assist in the development of biological indicators to monitor the movement and presence of CO2 deep underground.